Just bought the Osir V1 Vented Fender Kit! I just bought the Osir V1 Vented Fender Kit. Since my big turbo upgrade, my car was overheating on race tracks. In order to get colder and more air under the hood, I am planning to install the vented fenders, change the front bumper and maybe install a hood scoop. But first things first. I’ll post pics when I get the kit. I already know I will have to make mods under the hood because the kit is primarily used for it’s looks. More to come. And the best price was at: Z Max Autosport: 499$. But it didn’t stop there, they had the part in inventory (unlike some of the other sites) AND a 5% discount coupon. If you Google the store name + coupon, you should be able to find the coupon code, which you paste on the order page to get the discount. 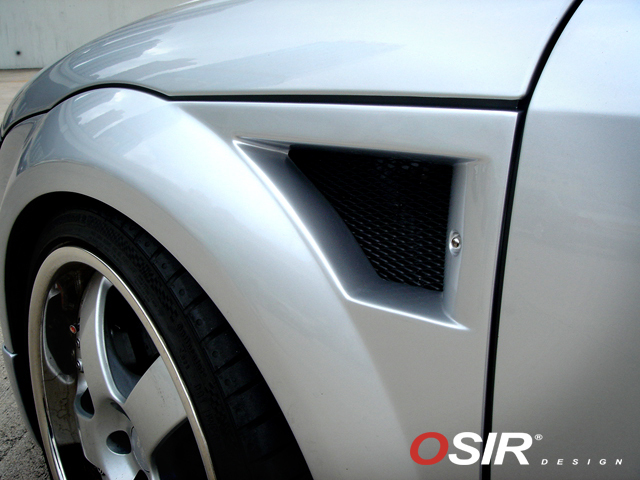 This entry was posted in Audi TT MK1 and tagged Body Kit, OSIR, OSIR V1 Vented Fender Kit. Bookmark the permalink. 3 Responses to Just bought the Osir V1 Vented Fender Kit! Looks nice. Did you get it painted and installed yet? Want to sell me your OEM fender? I decided I will install a DMC Wide Body Kit instead!